A little way out and further down on the map, an unassuming restaurant/hotel sat a few metres back from the road. After hours of winding hills and no snacks on standby (I know, the horror), anything would have impressed. However, we just so happened to stumble across a total gem! I'm massively kicking myself for not noting down the name of the place; if we were grading blogging skills right now I'd get an F, maybe even a U? 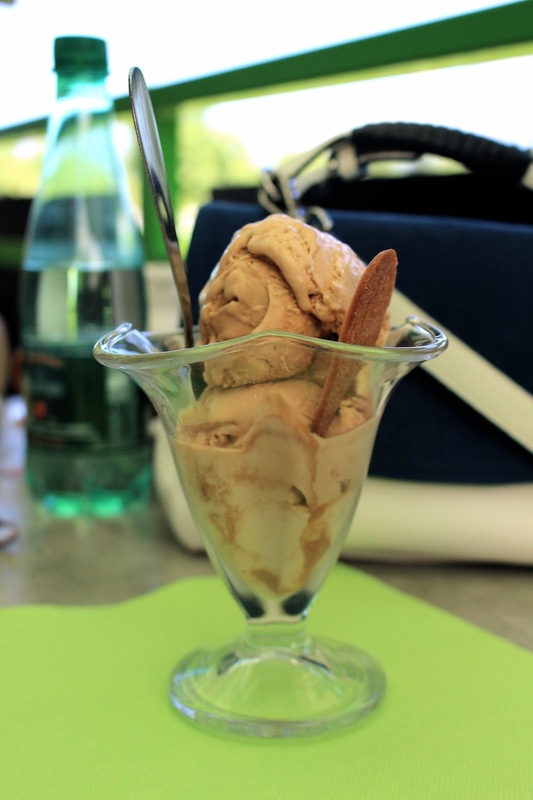 Anyway, although the kitchen had been closed for an hour, the chef very kindly allowed us to order, which meant I was able to enjoy a delicious glass bowl of caramel ice cream to the sight of mountains and sunshine - bliss! After many hours on the road, there were sighs of relief once we'd reached the Best Western Hotel Carlton. Parking was a little awkward, however entirely worth it. 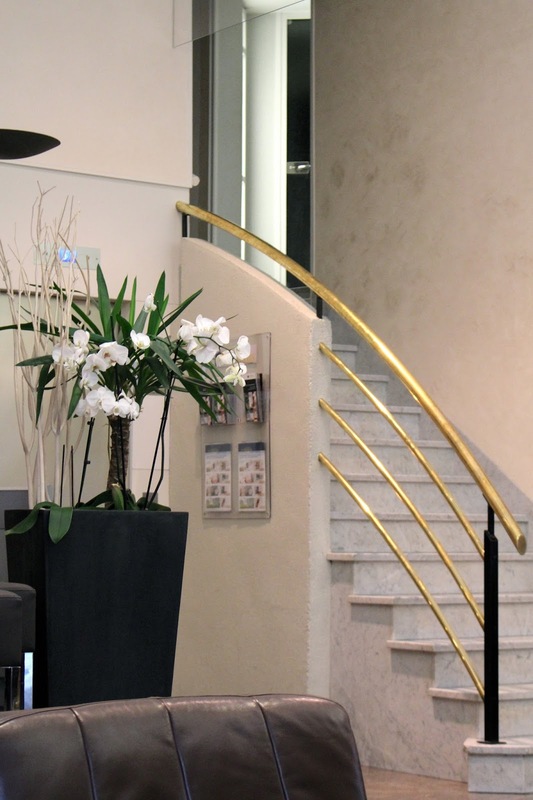 The hotel's corner-location was absolutely ideal, with the cobbled streets and winding canals being just a minute's walk away! 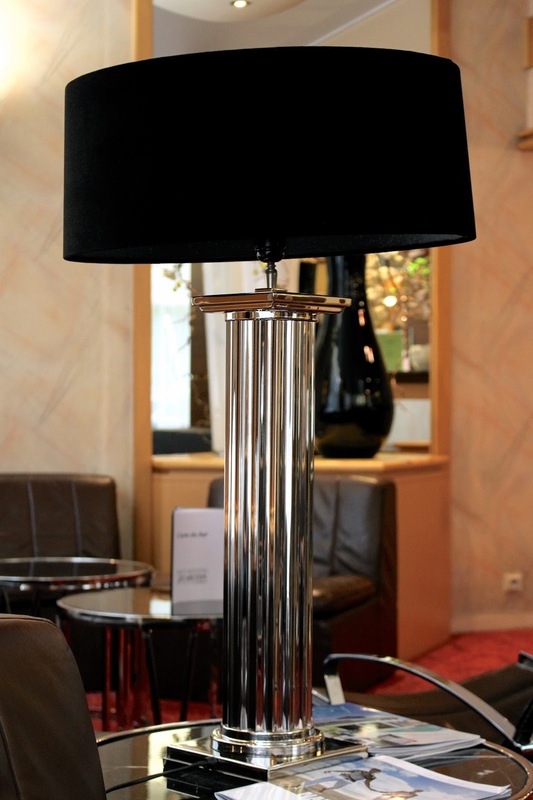 The interior design was pretty nice too, with a modern and clean scheme running through from the foyer to the rooms; Villeroy and Boch bathrooms, various eye-catching flowers and illuminated headboard silhouettes. As badly as I wanted to sit on the bedroom's balcony and watch the world go by, I forced myself to get changed and head out - there was exploring to be done! I felt a warm feeling in my heart moments into wandering the cobbled streets of Annecy, just as I had done upon my last visit many years ago. Personally speaking, I'm pretty sure it's partly because of the mountains - for some reason, I feel at home when they're in sight. Before reaching the winding canals and beautiful Lake Annecy, first on the agenda was a rather lengthy meal at a cosy crêperie. Everything about the meal was delicious, though my fly-killing skills were certainly put to the test while eating outdoors! After filling up on crêpes au sirop d'érable, a walk around part of Lake Annecy (the third largest lake in France) was on the cards. I still can't get over the view of the lake against the mountains; the colours were breathtakingly beautiful. Hmm, I'm noticing a pattern emerging! Similar to how I mentioned loving late nights spent watching the moon shine down on the sea in Part Three of my South of France travel diary, I gravitated towards my hotel room's balcony for the night's stay in Annecy. Mosquito-guard applied and silk pyjama set on, I pulled up a chair and watched the night unfold from the comfort of the balcony. The extreme heat combined with the simple sound of cars following the roads below, for some reason or other made the night very, very special. Fast forward to the next morning and I was able to truly appreciate the sunny view from the Hotel Carlton; the salmon-pink colour of the corner building ahead and the mountains in the distance made for one seriously pretty sight! I can't get over how perfect these 24 hours spent in the French alpine town of Annecy were from beginning to end - it was even better than I'd remembered! Being able to return to a destination and seeing the differences is such a treat! Everything looks gorgeous, what a trip! I went here years ago (in the wintertime) and absolutely loved it! I still remember the delicious fondue I had there! Annecy certainly looks like it is a town filled with old world charm and the way it looks to be framed by the mountains and lake is just so picturesque from any angle. How lucky you were you to stop by on a return visit to compare and contrast how much it has changed since your last visit. This place is so beautiful! Your recent travel diaries have made me very jealous! Wonderful photos and you look just stunning Gabrielle! If the place is as beautiful as Annecy, I don't see why it should be changed. It's magical. Gosh, I so wish I can transport there ASAP. 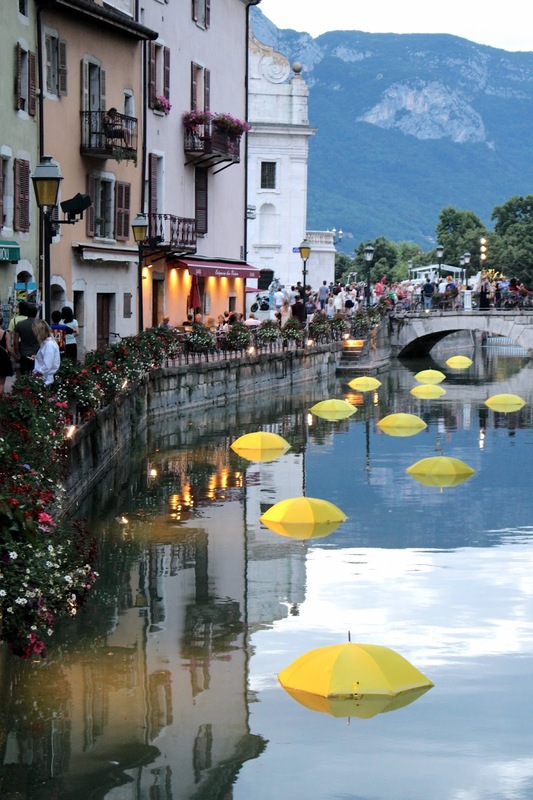 Ooh I love Annecy too, when I last visited there weren't those umbrellas in the river - such a cool installation! Everything is just out of this world! I wish I could visit! Annecy looks absolutely gorgeous!! And I love the yellow umbrellas in the river! Wow girly, this city is so vibrant, full of color, and so beautiful. You documented it very, very well. It is beautiful and was an absolute joy to read. beautiful! Uggg...can I be your travel buddy!? You are always exploring the most lovely places! This is awesome!I love this post. Cute you. All your photos are breathtaking, Gabrielle! Were those yellow umbrellas floating in the canal! Gorgeous! Your pics are breathtaking, Gaby! 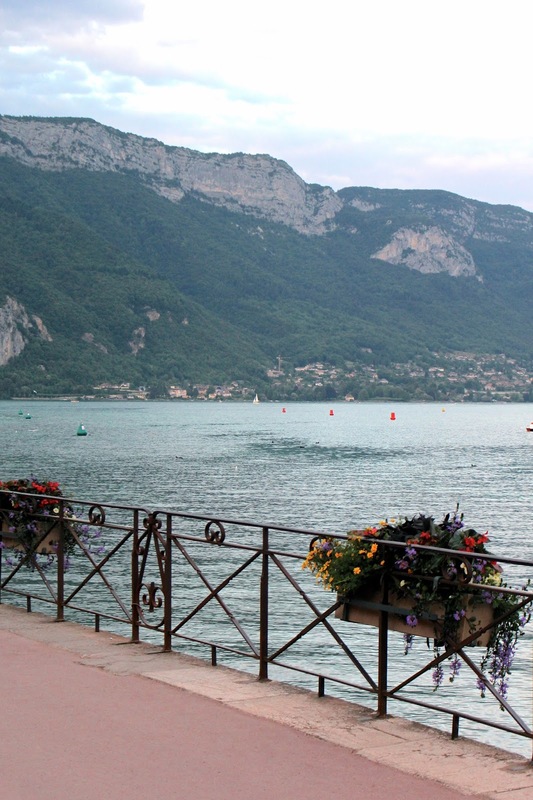 Nothing better than traveling and Annecy looks so dreamy! I have wanted to visit Annecy for ages, it looks beautiful! I can see why you went to your hotels balcony, so nice and relaxing to be able to lookout from your hotel room! The place is just screaming romance. It's very picturesque! Annecy looks like a really lovely place for a visit! I'm not sure if I'll ever get the opportunity to visit but I am living all my travelling dreams vicariously through you. Annecy looks beautiful, very much like a scene from a Romantic movie set. Literally postcard views dotted around everywhere you look! Will reply to your email soon lovely lady! I love Annecy so much! I've been there quite a few times during my summer holidays, and funnily enough I've actually been there just last week. You did a great job at showing how beautiful it is, and how much good food you can eat there haha. I love the vieille ville with all the colourful house façades and the narrow passages that you can't help but take to see where they lead you... It's definitely a city to wander and explore! Annecy looks charming. I know what you mean about not wanting to see some places to get modernize because the laid back old school feel is why you love it. It was really cool of the chef to let you order after the kitchen close you hardly get service like that anymore. How adorable and quaint! I will be dreaming about this place! The flowers and water views are gorgeous. What a special trip! Gosh Gabrielle, my jaw actually dropped! These photos are stunning, and the town looks so sweet. I can understand why you love it so much! Annecy is so stunning and has long been on my list of must visit locations. You captured it so beautifully Gabrielle! Such a beautiful place and you are looking so gorgeous. If it wasn't for you, I wouldn't even know about this French alipine town! Annecy does look like a lovely town to visit and it seems like you had fun on your 24 hour visit. It is always interesting to revisit those places that are stuck in our memory as being a certain way. I know what you mean when you say you wouldn't want it to change too much. I have places like that too, those that are special to me and I just couldn't bear them becoming too modernized and different. Let's hope that doesn't happen with our 'special places'! but before the hotel, the city and all...how perfect is that view of mountains? What a panorama! perfect views to accompany your enjoyment of ice-cream! How nice of chef to be willing to serve you a portion even if kitchen was closed. The views of mountains and the lake were pretty amazing in the city as well. The sight of mountains makes me feel at home too! I can't imagine living without the sight of mountains. They're very special to me... I suppose it is because all the towns I ever lived in were surrounded by mountains...or mabye I just love them. 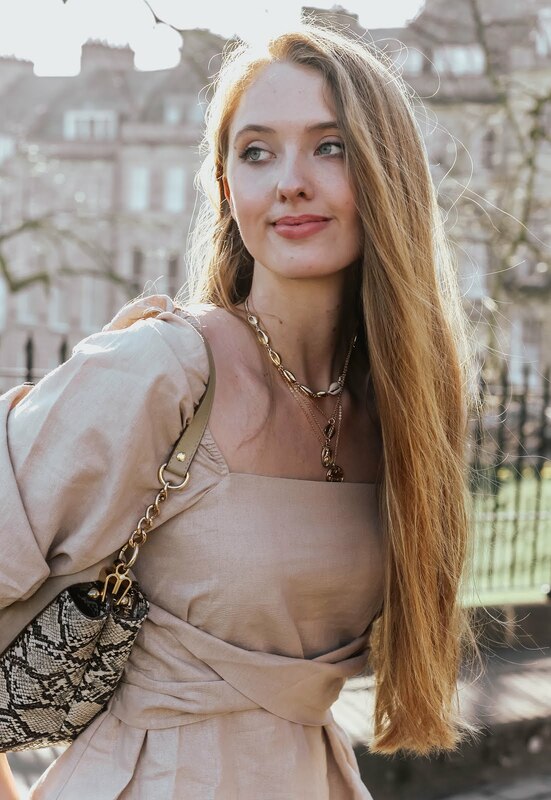 I love all of your outfits featured here! You always look very fresh and lovely! Have a great day! Thank you for your recent comment and feedback. Some places should never be allowed to change, I agree with you on that, and mountain villages in France are among them. Watching the night unfold is such a relaxing feeling, it is pure bliss on holidays for me as well. So, Annecy is the cutest place ever! I'd never even heard of it before this post but it's breathtakingly beautiful! What an amazing place! This place looks ridiculously dreamy - I've never heard of it, but it's now on my bucket list! What a beautiful place! I'm also a fan of Villeroy and Boch as they used to make their products in Luxembourg. The brand is very popular over here. How I'd love to be eating ice cream and looking at that mountain view right about now. Love seeing all of these photos and living vicariously through your travels! That's a beautiful little place which I have never heard of, but truth be told, I have not holiday-ed in France. I've only just made it to Calais to the ferry. It kind of scares me to go to France as most refuse to speak English and would not know how to get around easily. Is this true for the South of France? How cute are those yellow umbrellas in the river? How gorgeous is Annecy? And you look like you're having so much fun! I never went there in France but woow the houses are so pretty ! I love the colors of the streets ! It looks like you really enjoyed it. It looks absolutely wonderful, especially with the mountains in the distance! So picturesque. And you, of course, look stunning as usual! Gabrielle, this looks like a fantasy dream - wow! This place is so idyllic! I agree with you that it's great to see a place evolve but you never want it to loose it's charm or personality because of it. I've not been to Annecy before, but it looks lovely. I normally head from Calais to Paris, and only visited a few cities in between, yet after seeing this, I have added it to my list! Lovely landscape photos! 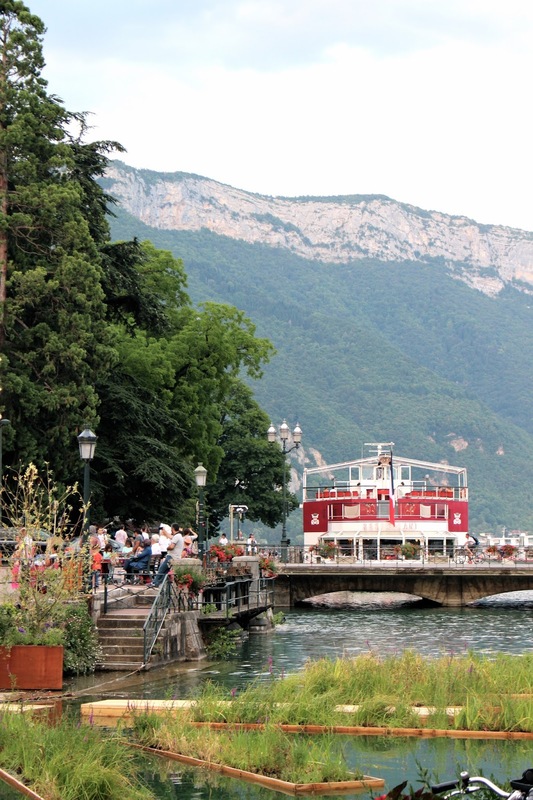 I have never been to Annecy, but I love its authentic charm which came through in the photos. I love the sight of mountains too. I saw loads whilst in Nevada. They always seem surreal to me. Looks beautiful!! Ahhhh it looks like right out of a Disney movie! This looks so beautiful! Definitely adding this place to my travel bucket list! Omgosh this place is absolutely charming and picture perfect!I wouldn't want this place to change much either! It looks so gorgeous. My boyfriend's sister lives there and I need to visit this pretty city soon! angelic beauty Gabrielle!!! and those views! super stunning! I am so jelly because living in the UK means that you can travel around very easily. I am back home in Asia now so I have to fly across the world hehe. Keep it coming girl, I love the travel diary! You surely have enjoyed the summer, gurl. I haven't been to France before, and its definitely on my bucket list now. You've sold me on the place. Great shots as always and that ice cream....oh myy! Annecy is such a beautiful place! Love your photos!! !